The over century old Colombo Colts Cricket Club is now a magnificent work of art, thanks to that benefactor Kangadaran Mathivanan, who was a more than ordinary cricketer during his time. Many told me that the Colts Cricket Club has been given a facelift and that I should go there and have a look see for myself. When the invitation came along that Hayley's were going to sponsor the club's cricket and that there was going to be a media briefing, I made it a point to visit. When I walked in, I could not believe my eyes. The pavilion looks gorgeous. It has been extended with maximum seating capacity, the walls decorated with pictures of their great cricketers of the past and the bar is air conditioned. 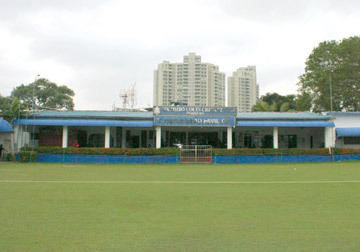 The players dressing rooms have been shifted to the right of the pavilion. There's accommodation for the cricketers wanting to stay overnight and in addition to these renovations, the ground looks like a billiard table. And the man who made it all possible is none other than Mathivanan. Now Mathivanan is a former cricketer from Hartley College, Jaffna who also sported the colours of the Jaffna Combined Schools as a dashing right hand batsman and penetrative medium pace bowler. Coming to Colombo Mathivanan joined the Saracens Sports Club and played for them for a couple seasons, before throwing in his lot with the Colts Cricket Club. Saracens loss was certainly Colts gain. Mathivanan when he was a member of the club, made a careful study of what the club was lacking and once he was voted President of the Club, began to immediately realize his dreams of making the club one, if not the best in the country. In his endeavour to uplift the club he had a wonderful set of office-bearers who joined in the scrum as it were and partnered him and today the club house and the ground is looking marvelous. Wanting to know how he managed to do things for the club, I visited him in his office on Saturday morning which was a holiday in his company - East West Marketing - and got talking to him. At first he did not want to 'blow his own trumpet'. But a bit of coaxing and Mathivanan broke the silence and very shyly revealed his love for the club and his ambition to make things comfortable for the sportsmen and women of the club and its members. "It was no easy task to renovate the pavilion and the ground. The main obstacle was the money. While moves were being made to find the all important finances, I stepped in with my own money and got things moving. "I always made it a point to be on the spot and give direction to the workers. The work went on apace and everything was completed on schedule. I do not want to reveal the money I spent, but it was a lot. I am proud to see the club looking so beautiful. He even sponsored the club's cricketers. "Being a sportsman I always revel in a challenge. When I got the top post in the club, I took it on as a challenge. And that challenge was to see to the betterment of not only the club but its cricketers and its members," said a contended looking Mathivanan. The club is now well protected with a wall being built round the ground and today the club could host any international team. He has more plans for the club and did not want to reveal them just now. 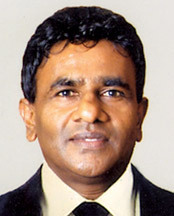 Mathivanan took over the reins of President of the club in 2001 and is still in that position. Members of the club who I talked with spoke in glowing terms of the President. Patron Ranjit Samarasekera, Vice Presidents Trevor Rajaratnam and Nishantha Ranatunga and Secretary Ricardo Fonseka were lavish in their praise for this benefactor and credited him for the wonderful state that the club is in now. Mathivanan's honesty and flair for hard work saw him being made Secretary of the Interim Committee of Sri Lanka Cricket. There too he served with dedication, determination and honesty and was appreciated for the good work he was doing for the game. Mathivanan proudly stated that when he was secretary he never for once used the finances of the Interim Committee to go on official trips. 'I spent my own money and no body can level allegations against me when I was secretary', said the President of Colts CC. The present Chairman of Sri Lanka Interim Committee D Somachandra de Silva, Selector Ranjit Fernando and former national coach Dav Whatmore were amazed to see the wonders done by Mathivanan to bring the club to the beautiful state that it is now in. Mathivanan had a good word for D.S. de Silva whom he described as honest and hard working and said that with DS the game and the administration is in safe hands. "DS will deliver," he said. 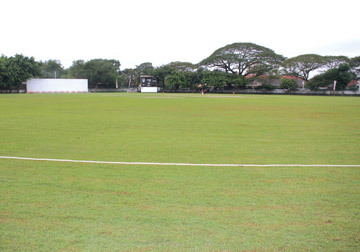 While on the topic of the three international cricket stadiums to host the 2011 World Cup was being spoken about - the R Premadasa. President Mahinda Rajapaksa - and Pallekelle, he revealed that it was he who first signed the papers for the land to be taken over at Pallekelle and for a stadium to be built. There were people who contributed to make this stadium a reality. But unfortunately things went wrong and that idea was shelved. He also revealed that the idea of a stadium in Pallekelle came about because of the problems they had with the Asgiriya Stadium which was the brainchild of former President of BCCSL Gamini Dissanayake. Mathivanan has only one regret and that was that he was not allowed to continue as Secretary of Cricket's Interim Committee. His honesty and flair for transparency which did not go down well with the powers that be of that time, led to his being held back. But he did not give in to the threats, but continued to serve because he was put in that position by Sports Minister Gamini Lokuge. He said that because of the folly of one bloated individual who at times acted like a thug the entire committee had to suffer. The Colts President also had a word for former Media Manager Samantha Algama and said it was a pleasure working with him. 'Samantha had a wonderful rapport with the media and it was a backward step losing him'. Mathivanan is not one who will give up the fight that easy. "If at any time I am called up to serve Sri Lanka cricket I will do so with great pride and enthusiasm. In President Mahinda Rajapaksa, the country is fortunate to have a sport loving President who is keen and determined to see to the betterment of the player, the sport and the administration," he concluded. Incidentally the writer too played for Colts CC for two years in 1964 and'65 under the clever leadership of W Premaratne. The players of those teams whose names that come to mind are Abu Fuard, Brian and Darrel de Silva, Merril Guneratne, M N Samsudeen and Ben Fernando. In that era the pavilion was a small compact one. The playing field was uneven and at times even cattle used to stray into the playing area. But now those are things of the past. Colts Cricket Club now looks a PICTURE - thanks to Kanagadaran Mathivanan.